We take a look at Samsung's latest drive, featuring Thunderbolt 3 connectivity. The Samsung SSD X5 is a very compact, blazingly fast SSD with good security settings and drop proof body up to 2m. Some may be put off by the limited Thunderbolt 3 compatability with older machines, but if you have a newer PC or Mac it's a great choice. The Samsung SSD X5 is the latest SSD (Solid State Drive) from Samsung. 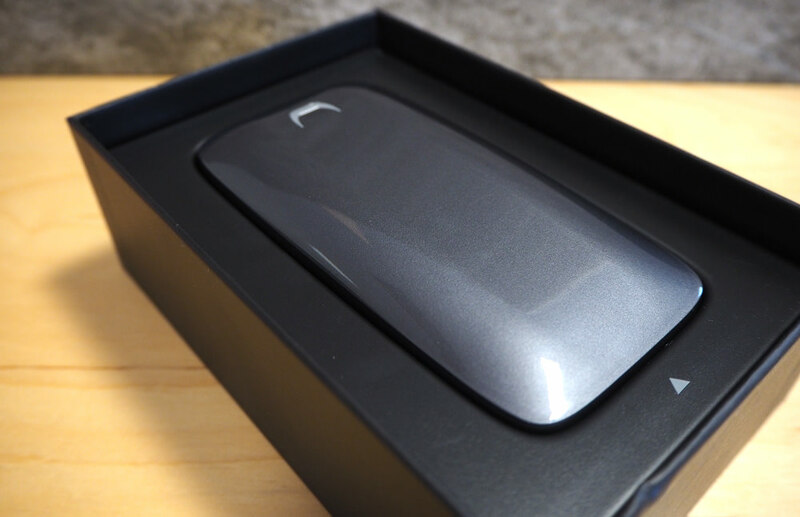 It's a super compact model that's available in 500GB, 1TB and 2TB sizes. Here, we take a look at the 1TB edition to find out how it performs. 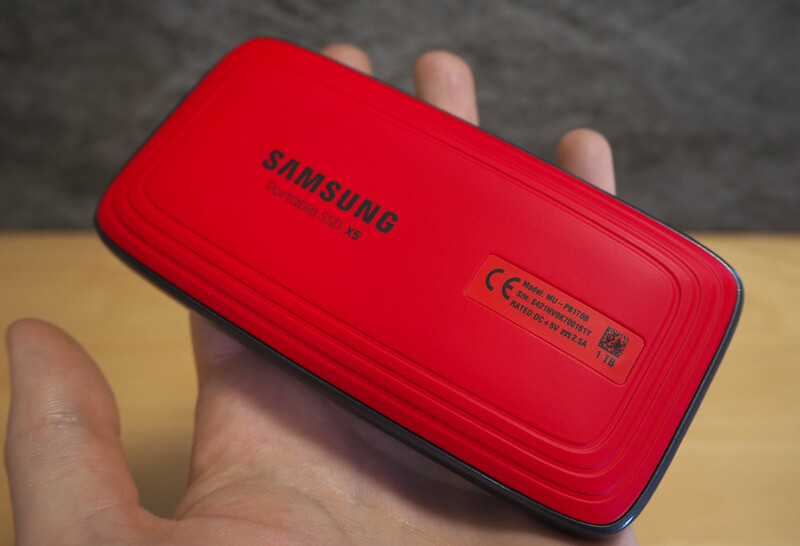 The Samsung SSD X5 has a very sleek, trendy design, with a silver gloss shell on top and a red rubberised bottom for grip. 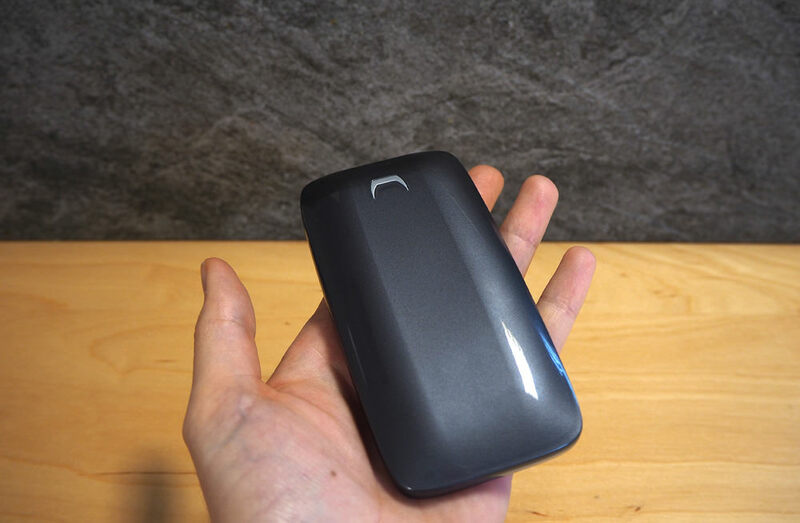 It's a smooth, curved device that fits nicely in the hand or easily in the pocket. The device is powered by Thunderbolt 3 (40 Gbps) technology, offering a max of 2800MB/s read and 2300MB/s write speeds. There is optional password protection which can be applied to the drive for security, using AES 256-bit encryption. The SSD X5 has thermal management technology, DTG (Thermal Dynamic Guard) which helps maintain optimal performance and temperature. There is also a heat sink which keeps temperatures below 45 degrees C.
Being an SSD, there are no moving parts in the drive and it's reinforced with magnesium alloy allowing it to withstand drops of up to 2 meters. Samsung claim that the drive will let you transfer a 20GB 4K UHD video from your PC to the drive in just 12 seconds. The SSD X5 uses Thunderbolt 3 technology for speed, however, many older PCs and Macs do not have Thunderbolt 3 ports built in, and whilst the cable looks like a USB-C cable, it simply won't work in a USB-C port, without Thunderbolt support. This means that to be able to use the drive you need a new high-end PC or Mac, or to buy a Thunderbolt 3 adapter for around £54 that can be built into your PC (if your motherboard is compatible). This will limit who can actually use this drive straight out of the box. There's an LED light, so you know when the drive's in use. When tested using CrystalDiskMark we saw speeds up to 2052MB/s (Read) and 1529MB/s (Write), with a Dell laptop, quicker than any other drive we've ever tested. You may even be able to get quicker speeds depending on your computer.